They may look all light and fluffy, but the reality is that clouds are actually pretty heavy. Researchers have calculated that the average cumulus cloud – which is that nice, white fluffy kind you see on a sunny day – weighs an incredible 500,000 kg (or 1.1 million pounds!) [Or, as LeMone explained it to Soniak, think of that as 100 elephants]. Measurements made with today’s technology have revealed that between 3 and 30 percent of the sunlight is reflected at the surface of the sea. Then, almost all of the seven colours of the light spectrum are absorbed, one after another, in the first 200 metres, except for blue light (picture at left). Below a depth of 1,000 metres, there is no light at all (above picture). This scientific fact was pointed out in Surah Nur 40 in the Qur’an 1,400 years ago. In deep seas and oceans, the darkness is found at a depth of 200 meters and deeper. At this depth, there is almost no light, and below a depth of 1,000 meters there is no light at all. Human beings are not able to dive to a depth of more than 70 meters without the aid of special equipment. They cannot survive unaided in the dark depths of the oceans, such as at a depth of 200 meters. For these reasons, scientists have only recently been able to discover detailed information about the seas. 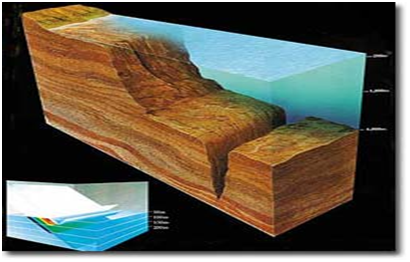 However, that the depth of the sea is dark was revealed in the Qur’an 1,400 years ago. It is certainly one of the miracles of the Qur’an that such information was given at a time where no equipment to enable man to dive into the depths of the oceans was available. The statements in the Qur’an run parallel precisely the above explanation. Certainly, this fact, which scientists has discovered very recently, shows once again that the Qur’an is the word of Allah. The picture to the left represents internal waves at interface between two layers of water of different densities. The lower layer is denser than the upper one. This scientific fact, declared in Sura Nur 40 of the Qur’an 14 centuries ago, has been discovered by today’s scientists only very recently. Next week we will use one of these miracles to explain a certain group of people.